Kim Perell, Award-winning entrepreneur, angel investor, leading technology CEO and best-selling author of The Execution Factor. Execution separates the dreamers from the doers: the ability to do and get results—to keep moving forward to achieve your vision and goals in business and life despite the challenges, hardships, and obstacles that lay ahead. 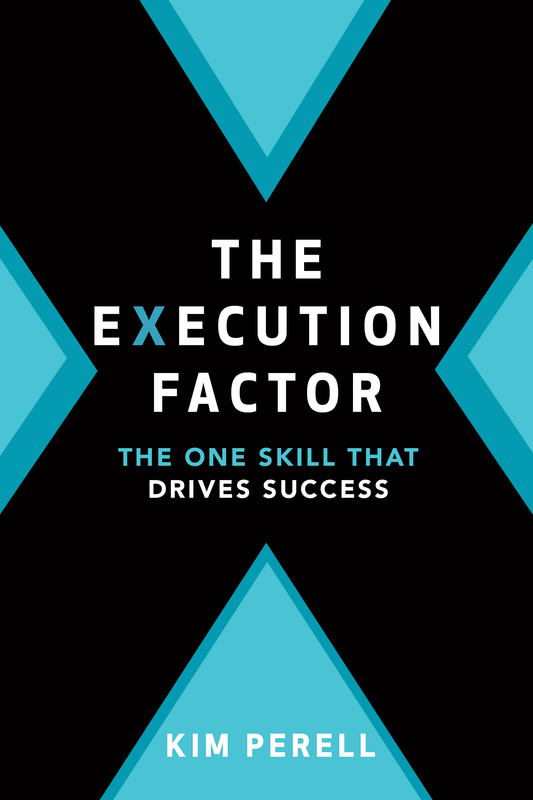 Execution is what I and the most successful entrepreneurs and leaders I have known had mastered. Execution disrupted complacency and markets. Regardless of role, organization, or industry, execution was the difference between success and failure. As I explored this idea further, I found not only personal and anecdotal evidence for my belief but also supporting data. According to Harvard Business School professor Robert Kaplan and his colleague David Norton, 90 percent of business strategies fail due to poor execution. Furthermore, based on a Harvard Business Review database, employees at 60 percent of companies surveyed claimed that their organization was “weak” at execution. Specifically, these respondents denied that their organizations were able to quickly translate important strategic and operational decisions into action. What I believe is that those organizations failed to turn what they were doing into results and sustainable success. Action was only part of the equation. Yahoo! had gone public while I was in college, and by the time I graduated, the dot-com boom was reaching a fever pitch. All of a sudden, there seemed to be opportunities and money everywhere. It was thrilling. It was a gold rush, and the Promised Land was the Internet. The frenzy was impossible to resist. I ended up accepting a job as a marketing analyst at a dot-com— the seventh hire at a startup in Los Angeles. The company was a kind of 1990s precursor to Dropbox. I was there when we raised our first million and when we raised $120 million more in venture capital shortly after. Things quickly grew exponentially in the office, and we expanded to more than 300 people. I oversaw the entire Internet marketing and sales division. At 23, I had 30 people reporting to me, many of them close friends and people I knew from college whom I wanted to share the opportunity with. Then in March 2001, the dot-com bubble burst, and my company went bankrupt. I had to lay off all my colleagues and some of my dearest friends (some of whom did not talk to me again for years). They had bet on me. They had trusted me. I had failed them. When I was done laying them off, the company fired me too. At 23, I was unemployed and broke again. While the company I worked for was hemorrhaging cash, my division was generating revenue. I was growing advertising revenue even as the company crashed. The Internet was still growing at a bewildering pace. Millions of new people were getting online, and companies wanted to reach them. I knew there must be opportunities in digital advertising, especially for those businesses that didn’t need or couldn’t afford a large advertising budget. What they needed was me, and to start again, all I needed was a computer, an Internet connection, and my experience and relationships to leverage. But while I had the knowledge and the relationships, I didn’t have a place to live and work or the money to buy the computer and get online. Love solved the first problem: My boyfriend at the time was born in Hawaii. His parents said if we could get there, we could live rent free in their condo for three months. My family solved the other problem: I borrowed $10,000 from my grandmother with promises to pay every dollar back as soon as I could. There was nothing vacation-like about my move to Hawaii. My new business took over the small condo from the kitchen to the living room. My desk was the black marble surface of the kitchen table island that extended from the counter. Wires and cables for the computer and phone dangled like tentacles over the side. We tucked the printer and fax into a nook next to the coffee maker. Boxes and stacks of paper sat on the stove. My company expanded as the online advertising market grew and the demand for pay-for-performance advertising proved to be a growth opportunity for digital companies. Within a few years, we had generated over $3.5 million in revenue with 63 customers and five employees. Each year after, we doubled our revenue. We not only outgrew the kitchen but also Hawaii, and we moved back to California to be closer to my husband’s family in San Diego. Five years into growing the company, something happened that changed everything. I was having lunch with a friend who also owned an Internet advertising company, and he told me he was going to sell it. I thought to myself, Maybe I should do the same. I hadn’t intended to sell my company when I started it. My only goal was to meet my three conditions of satisfaction—freedom, be my own boss, control my destiny—and have the life I envisioned. The sleepless nights, the stress of having employees, and the 16-hour workdays had added up, and selling the company would give me time to fully secure and maybe even enjoy my financial freedom. I didn’t go from broke to multimillionaire. I went from broke to $100,000 and then from $100,000 to $1 million and then from $1 million to $10 million, and so on, recommitting myself to execute better after I reached each milestone. That’s how I kept climbing. That’s how I kept evolving. That’s how I became the master of my success. Mastering execution will allow you to reach your goals and mark new milestones.